Try This: Whispurr. A New "Macro" Messaging Service. Try This: Whispurr. A New “Macro” Messaging Service. Whispurr is a messaging service that allows you to send 300-character (macro) messages to different groups, from one account. Not really different enough yet to tempt users away from existing messaging services. If it expands its mobile services that could very well change. Whispurr might seem like a Twitter clone with more characters at first glance, especially when you see the simplicity of the layout, but it has many features to make it stand out. If you have a Google account, you can sign up for a Whispurr account without filling out a form, but the process for changing your password is quite tedious. Once you’ve logged in, a nifty link shows up under the text box to help you get started. Clicking on this shows a quick overview of how to post a message, import Gmail and Yahoo contacts, invite friends, and update your profile. All of these tasks are easy to do, and only take two or three clicks. Once you’re set up and ready to start exploring, you’ll find more of those handy tips on each page to explain how to use the service in different ways. The basic functions of Whispurr work similar to Twitter – you can read through the public thread, reply or forward messages or add them to favourites. One cool difference in the basic posting features is the option to record a video and attach it to your message. You’ll need Flash installed to do this, but it was quick and easy when I tried it out, and could prove to be a popular feature. Another great feature that Twitter users will rejoice over is threaded replies. Each reply you make is connected to the original message, making it easy for you (and others) to follow your conversations. So what makes this truly different to other public messaging services? Firstly messages can be sent to a single user, like the one pictured above, or to a whole network you’ve created using the lists feature. Secondly you can also opt to broadcast your message to the entire Whispurr network through the public channel. This makes Whispurr a perfect way to communicate with colleagues, friends, and family in different ways from one central hub. Once you’ve got the basics down, there are some more exciting ways to use Whispurr. 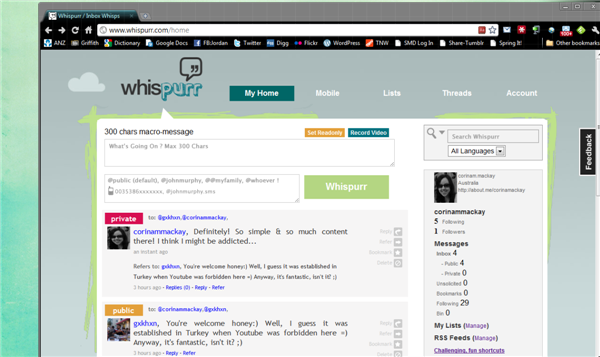 Using your email address, you can send private and public messages straight to your Whispurr account. Even better, you can send Whispurr messages to your friends’ mobile phones – whether they have a Whispurr account or not. This can be done from the Web interface or through your email account, and is free, but unfortunately only available to a few European countries so far (Italy, Turkey, the UK and Ireland). In many respects Whispurr seems to tread on Friendfeed territory, but if the mobile features expand overseas anytime soon, it could be a big deal. Obviously, Whispurr isn’t but a whisper compared to twitter’s noise but there are definitely some advantages to trying it out. Go sign up here, and tell us what you think.